The study of geometry begins with the definitions of the five simplest geometric objects — point, line, segment, ray, and angle — as well as two extra definitions (plane and 3-D space) that are thrown in for no extra charge. Collectively, these terms take you from no dimensions up to the third dimension. Point: A point is like a dot except that it actually has no size at all; or you can say that it’s infinitely small (except that even saying infinitely small makes a point sound larger than it really is). Essentially, a point is zero-dimensional, with no height, length, or width, but you draw it as a dot, anyway. You name a point with a single uppercase letter, as with points A, D, and T in the following figure. Occasionally, lines are named with a single, italicized, lowercase letter, such as lines f and g in the figure..
because either way, you start at A and go forever past B and C.
however, is a different ray. Angle: Two rays with the same endpoint form an angle. Each ray is a side of the angle, and the common endpoint is the angle’s vertex. You can name an angle using its vertex alone or three points (first, a point on one ray, then the vertex, and then a point on the other ray). Check out the above figure. The number is just another way of naming the angle; it has nothing to do with the size of the angle. The angle on the right also illustrates the interior and exterior of an angle. Plane: A plane is like a perfectly flat sheet of paper except that it has no thickness whatsoever and it goes on forever in all directions. You might say it’s infinitely thin and has an infinite length and an infinite width. Because it has length and width but no height, it’s two-dimensional. Planes are named with a single, italicized, lowercase letter or sometimes with the name of a figure (a rectangle, for example) that lies in the plane. 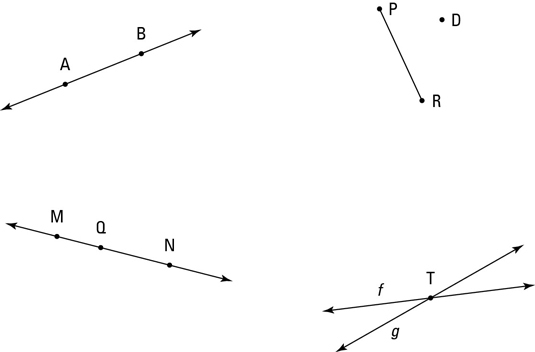 The above figure shows plane m, which goes out forever in four directions. 3-D (three-dimensional) space: 3-D space is everywhere — all of space in every direction. You could start with an infinitely big map that goes forever to the north, south, east, and west. That’s a two-dimensional plane. Then to get 3-D space from this map, you’d add the third dimension by going up and down forever. There’s no good way to draw 3-D space (the above figure shows one attempt, but it’s not going to win any awards). Unlike a box, 3-D space has no shape and no borders. Because 3-D space takes up all the space in the universe, it’s sort of the opposite of a point, which takes up no space at all. But on the other hand, 3-D space is like a point in that both are difficult to define because both are completely without features.